At Premiere of A Short Walk in a Rainforest. 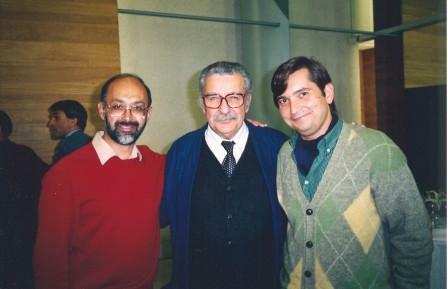 during the Radio France International Guitar Week in Paris 1996. This was a recent interview with that Simon did with me when he was here for the 2017 Sydney Guitar Summer School - we chat about my background, work, approach to composition and play a few pieces. I'm one of countless classical guitar fans and exponents who've enjoyed the music of Richard Charlton over many years, but I hadn't realised he was reaching a significant anniversary until his great friend and muse Karin Schaupp rang me to remind me he was celebrating his 60th birthday on 29th January. So our Music Makers conversation this week is as much a celebration of his valuable contribution to Australia's reputation as a centre of guitar excellence and innovation, as a chance to tell his story. Born in the UK, Richard emigrated to Australia with his family in the early '60's, eventually settling in Sydney. 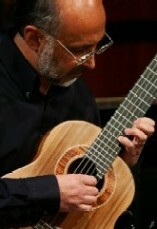 An LP of John Williams was the first classical guitar album he heard and eventually he persuaded his parents to buy him an instrument, a Chinese instrument made of plywood with steel strings and hard metal frets which dug into your fingers, but Richard taught himself and soon began making up his own tunes to expand his repertoire. Something in the nature of the actual sound, the plucked string with your fingers directly in contact with the music-making material, he says, attracted him to the guitar initially and sustained that early passion. Richard had no ambition to take on the life of a soloist, and came to performing publicly only gradually through ensemble music, eventually writing more complex works at the request of friends and colleagues. Timothy Kain gave him his first 'official' commission, the first of many for himself and his pioneering ensemble Guitar Trek. Countless others have followed. Richard loves the experience of collaborating with a musician on a commission, getting inside their head and then sharing the results with an audience in concert or via the recording studio. He does a lot of work writing music for young people (including for the AMEB syllabus) and for people of all technical levels, believing this is an important part of a composer's life. He does compose away from the guitar but his own instrument remains his specialty and you'll hear his carefully chosen musical selections include several favourite compositions written for favourite interpreters. It was a pleasure to meet this modest musician/composer who has given so much to his adopted country responding in a very visceral way to our landscapes and people. AN EXTRACT FROM AN INTERVIEW PUBLISHED IN THE UK MAGAZINE "CLASSICAL GUITAR"
Q. Being a player has obviously provided you with special insight into the guitar. Can you describe in what ways this experience has had a bearing on the way you write for the instrument? Richard Charlton: In the first place I think you have to ensure that as a player you can think outside of the instrument's boundaries and your own space so that you are not limited to the clichés. I am not suggesting that one should avoid the clichés necessarily. After all, they have come about for a very good reason and that is quite simply that they work - they demonstrate what sounds well on the instrument. What I have tried to do is to integrate them into my compositions but only resort to their use when I feel they can best enhance or express my musical ideas. Otherwise if you deliberately set out to avoid them you are also limiting yourself in a way. Q. When did you begin writing for the guitar? Richard Charlton: Soon after I first started playing the guitar, which was at the age of 16. I was self-taught and my initial introduction to the instrument was a guitar "tutor" book. After a while I exhausted the book, and resorted to the right hand of piano music, which was fairly unsatisfying as you can imagine. Where I was living at the time I was somewhat removed from the music scene and contact with other guitarists. I didn't even know where to go for guitar music so I decided to write my own music. My pieces at that time were very rudimentary and I suppose largely based in form on the exercises and little pieces in the tutor book. So really I started to write for guitar just to give myself something to play. Q. What are the particular influences which have contributed to the development of your compositional style and approach? Can you also express why you are compelled to compose? Richard Charlton: I suppose the important influences have been the music I have listened to and the people I have met. Early on I used In listen to a lot of modal music, and Vaughan Williams was one of my favourite composers, but over the years there have been so many works which have left a lasting impression on me. I don't think I have favourite composers as such, rather, I have favourite, pieces. The desire for self-expression is what compels me to compose. I am sure that if I didn't compose I would be drawing or painting. Q. Can you tell me about your guitar works? Richard Charlton: There are a lot of works - student pieces, ensemble works, solos and a concerto. Perhaps I could isolate just a few which in some way I regard as special. Threnody for Chernobyl, which I wrote for Tim Kain in 1986, retains a special place for me. It was first time that I had specifically written for a player, other than myself, and a player that was better than me. I remember at the time that was very exciting, because I could explore more possibilities on the instrument than I could do myself. It was also special because it was the first work I had written to be recorded on CD. (The Anthology of Australian Music on Disc - a Bicentennial Project) Another work, which I have always regarded as special, is "Dances for the Rainbow Serpent" (1990) written for Guitar Trek. The line-up of this ensemble is somewhat unusual in that a requinto, baritone and bass guitar are used alongside the standard guitar. I had never written for this combination before, so at the time I felt it was going to be a bit of a challenge. The concerto "Mosaic" (1995), commissioned by the Darwin International Guitar Festival, was also special. I had to limit myself because of the nature of the orchestra that would be premiering the work, which was for the most part amateur. Therefore I tried to write something which worked well and wasn't difficult for the players but didn't sound as if it was composed in a facile way. Writing for an orchestra seemed to take shape quite naturally. Maybe being a guitarist was of assistance in that, when writing for guitar, you have to think in a linear and a vertical fashion. In addition, I liked the challenge of writing good music that is relatively easy to play, without it seeming to be easy. That's why I like writing for children, students and amateurs - it puts the composer into the community, which is partly where he should be to create his audiences. Richard Charlton: Places, things, events - something to do with where I live and my experiences, but not one type of source. Some composers are influenced by visual things. I am to a certain degree, but other things as well. Basically I need some kind of imagery or trigger to start the process. I can't sit down and write a piece in an abstract way - sure I could put notes down and make a reasonable piece but without "imagery" or a "trigger" it would be meaningless to me. I think the most important thing in composing is communication. Communicating an idea, a feeling or a mood. You have to find a way in which you can "move" an audience.